If you are planning on upgrading your school-based deployment of iPads & iPod Touches, check your Restriction Profiles to ensure the new feature settings are compliant with your school policy. Today Apple released iOS 6 – the new operating system for the iPad, iPhone and iPod Touch. 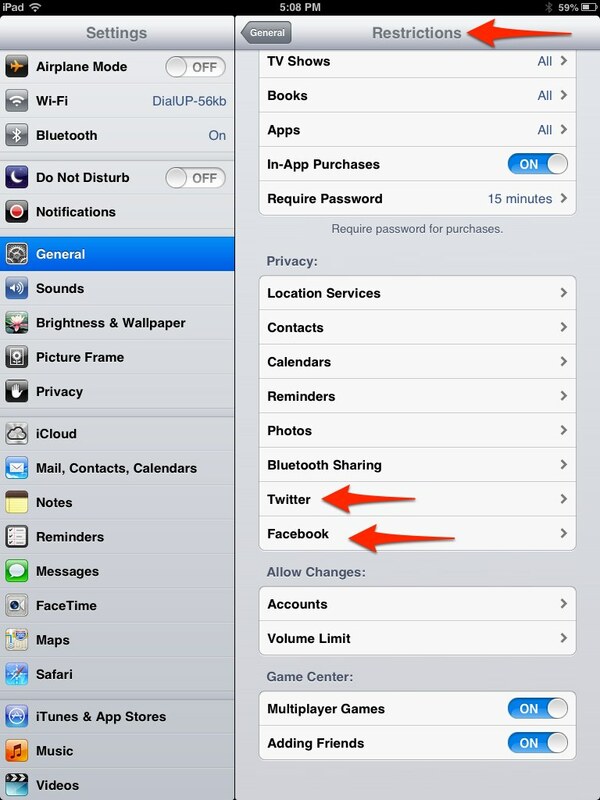 iOS 6 contains tighter social network integration, with deep links to Twitter and Facebook. For those of use deploying devices to students under 13, it is nice to be able to restrict this account integration as it isn’t technically legal for our students to have social network accounts. Devices can be managed by touching every single one, navigating to the Settings>Restrictions screen, enabling Restrictions and then switching off Twitter & Facebook. But for those of us with hundreds or thousands of machines to manage, this isn’t easy to do. Most iOS device managers use a combination of Apple Configurator for tethered updates and a mobile device management (MDM) tool for over-the-air (OTA) updates. I’ve been testing this afternoon and it doesn’t seem like any of these management tools have updated their Restriction profiles to allow for the management of these new Restriction features. Keep an eye out for Configurator updates in the new few weeks to help us support our deployments. If you have an MDM solution that has been upgraded, please comment or tweet back!